Like many people, you may be expecting the process of moving home to be a stressful event. With the major upheaval involved, the relocation of your family to a new environment, and the logistical challenge of planning the move, these feelings of trepidation are perfectly normal. One of the keys to ensuring your peace of mind will be to choose a removals company that you have complete confidence in. During many years of helping families plan to move, we are often asked the same questions again and again. Because we feel our answers to these commonly asked questions will be of direct benefit to you during this planning stage of your removal, we have listed the questions and our answers for your assistance. It is important to speak to our Removals Advisory Staff as soon as you have decided to move. This will save you valuable time that is often wasted on pre-removal tasks which may be completed in a more efficient, cost-saving way. “Saving your sanity” becomes a major priority during the weeks surrounding a move, and for that reason you will benefit from the sort of expert advice that will tell you how to minimise the disruption to your normal family routine. IS IT NECESSARY TO HAVE AN ON-SITE APPRAISAL BEFORE MY MOVE? Absolutely! In fact it would be folly to contemplate otherwise. The on-site advice that our Advisory Staff are trained to give will very quickly detail what needs to be done, what special needs may apply with your situation and the investment involved to suit your own needs. This on-site advice will not cost you anything, but it may very well save you money when you are shown the most ‘time and cost efficient’ way to plan for the day of your removal. You could not hope to benefit from money-saving hints without your on-site appraisal. HOW WILL MY GOODS BE PACKED AND REMOVED? If you have a lot of china, ornaments, mirrors and other breakables, ask us to professionally pack these items for you. Proper packing of breakables and expensive furniture ensures your own peace of mind - especially if your move is interstate. If you have the extra time to devote to your move, it may be a good idea to enquire about reducing the cost of your removal by packing all of the unbreakable items yourself. We can supply you with ample packing cartons on loan, free of charge, and collect them from you after the move. We also have special “porta-robes” if you need to keep all of your hanging clothes crease-free during the removal. 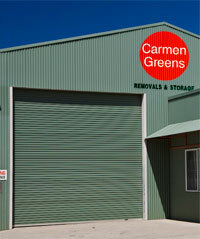 ARE ANY SPECIALISED SERVICES AVAILABLE AT CARMEN-GREENS? We have a wide range of services at your disposal such as - specialised transportation of pets, pot plants, cars - the dismantling and re-assembling of your ‘special assembly’ furniture, the careful packing of your electrical appliances, computers, hi-fis and antiques, house cleaning and other special requirements. 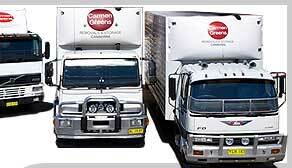 Quite frankly it pays to ask your Carmen Greens Removals Adviser	about any unusual or special removal request you have - that is	what we are here for - to make your moving day go smoothly! CAN YOU ARRANGE GOODS STORAGE FOR ME? Most definitely! Our storage is secure and regularly fumigated. All of our storage units are protected by our modern fire fighting equipments, and you can choose between conventional or containerised storage for short or long terms. When your removal is interstate or overseas, we even give you a detailed inventory of everything you leave with us so that you know where that special ‘something’ you once had is located, so that you do not have to rely on your memory at a later date. ARE MY GOODS COVERED BY CURRENT HOUSEHOLD INSURANCE DURING THE REMOVAL? Generally not, so I urge you to check with your own particular insurance broker or company. I always advise all or our customers to obtain transit removals insurance especially if the move is interstate or overseas. We can arrange that for you, and I might add that our insurance rates are considerably lower than most other removal companies because of our excellent claims record. There “special rates” that our insurers have offered to us have been directly passed on to you so that you benefit from our good insurance record. Remember too to advise your home insurance company or broker to arrange contents cover for your new address so that both old and new addresses have insurance cover that overlaps during the period of removal. ARE THERE ANY SPECIAL THINGS I NEED TO CONSIDER ON THE DAY! Lock pets safely away until the time is ready to transport them. Arrange babysitting for toddlers. Plan to assign special tasks to involve older children; such as being responsible for the packing of their own personal box of treasurers etc. This keeps them safely out of ‘harms way’ and yet still involves them in a way that will help them to feel they have made a positive contribution to the ‘big move’. Defrost and clean out your fridge, secure its shelves, and bolt down any appliances such as washing machines, hi-fi’s etc. Keep aside a specially marked “Load List” carton for items that you will need early in the unpacking at your new home. Mark other cartons with their contents and room destinations. Pack you personal belongings such as bank and cheque books, passport, wills, birth certificates and other valuable documents into a carton to be transported by you. When your removals team first arrives, point out to them what is and is not going to your new address - this saves valuable time later on during the removal and avoids the likelihood of mistakes being made through misunderstandings. Arrange for an ‘Advance Party’ to meet the removals van at your new address, in the event of your own delay. Well we hope that all of these answers help you to plan your removal more effectively. We are sure you may have other questions pertinent to your individual needs, so please call our Removals Advisory Staff as soon as possible. That is the only way to ensure that you are thoroughly prepared for the big day.